Sweeping out and around a stepped 1-1/2x 3-1/2" penetrated, devic veiled rainbow record keeper crystal with a rare shield face are clear and veiled tabular, penetrator, barrel-shaped Herkimer style, bridge and rainbow barnacle crystals. 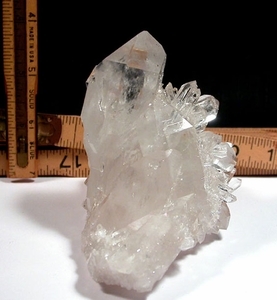 A 5/8x 1-3/4" stunner extends back from the main crystal to clearly show its' tabular 1/8x 1/2" manifestation crystal. Equally visible is a 1/2x 3/4" conchoidally-'faced' crystal - but you need to examine the fully crystallized base to see a neat trapezoidal blue manganese inclusion. Overall 2-3/4x 5x 3-1/2" tall, including the 'flying' tabular 1/8x 1/4x 1" bridge crystal. Clear Creek Mine, closed 1997.